Just outside Lisbon, Cascais is one of Portugal's first holiday destinations. King Luis was one of the town's earliest tourists circa 1870, coming from Lisbon to this, at the time, fishing village for sunshine and the sea. The Atlantic may be bracing but the fresh seafood is always excellent, the sunshine generous and there is plenty of beauty to appreciate after you've taken your dip. 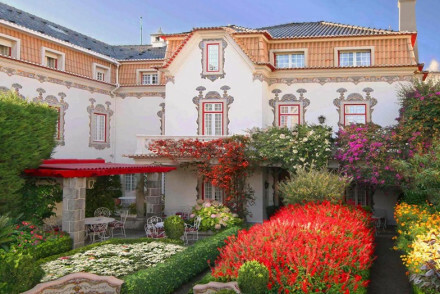 Not surprisingly, there are plenty of the best places to stay in Cascais. What has changed since Luis' patronage in the 1870s is that this once village has chichi-ed up into a sophisticated little town with more than enough hotels, a number of museums and some excellent restaurants. Cascais is a good size for exploring on foot, however, if you want to see a bit more of the local area then hire a bike. 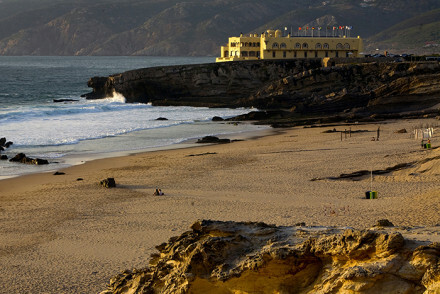 It may be a cliché, but Cascais really does have something for everyone. A number of small, interesting museums, shiny new marina, the famous windblown beach of Guincho and several world-class golf courses. On the weekend this is a busy town with crowds flocking out from Lisbon. The corso is where to head for a lively night out. Visit the pre-historic finds of the Grutas de Alparaia, a series of caves running under Cascais, only discovered in the 19th Century. One of the first places to explore should be the Palacio de Conde de Casteo Guimaraes Home to a vast collection of books - around 25,000 - some of them extremely rare. Wander around the Museu Condes de Castro, a nicely renovated 19th-century palace with wonderful architecture and lovely interiors. Or visit the bijou Museu do Mar, which tells the story of Cascais as a fishing village. Estoril was once famed for being full of spies, including Ian Fleming, whose fictitious 'Casino Royal' is based on Estoril Casino. You can walk around the headland to Estoril from Cascais along a charming beachfront esplanade past rows of restaurants, cafes and bars. Just out of Cascais is the Boca do Inferno, a rocky outcrop jutting into the sea, which booms and sprays like the 'mouth of hell' when big waves hit. If you're a windsurfer you probably already know about the winds of Guincho. This breezy beach is 5kms out of Tavira on a cycle and pedestrian route running along the sea. The Boca do Inferno is about half way. If you are coming in the busy summer months then be sure to book ahead, as the best places to stay in Cascais often get quickly booked up! 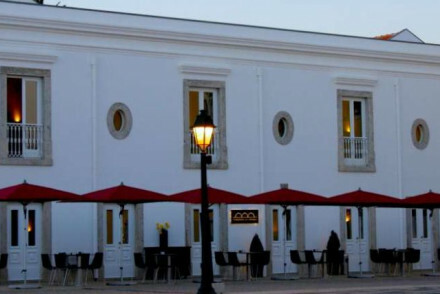 The Farol Design Hotel for cutting edge design and sleek, clean, white lines. The infinity pool almost touches the sea. There is an excellent restaurant and the bar is all chrome and glass. The relaxed style makes it one of the best places to stay in Cascais for couples looking for a romantic spot. Fortaleza Do Guincho is a beautiful beachfront 5*, boasting classically elegant accommodation with stone floors and period pieces. With a Michelin-starred restaurant, a pool and splendid sea views, the ideal romantic getaway. Another 5*, this time set in a stunning rural mansion, Tivoli Palacio de Seteas is a truly dreamy spot. You will love the opulent rooms in creamy tones and also the two pools set amidst lovely gardens. Work up a sweat on the tennis courts before tucking into gourmet cuisine. Set in a picturesque historic mansion, Casa Da Pergola boasts elegantly traditional rooms with chandeliers and classy furnishings - feel transported back in time to another era! Enjoy a good book in the inner courtyard and the beach is just a short distance away. All this from just €55 a night! Sitting almost in the sea, the 5* Senhora Da Guia is brimming with luxury. Chic accommodation which is traditional in style, a deluxe spa and a pool with stunning views of the Atlantic. Treat yourself to a massage and enjoy first-rate meals from the restaurant. 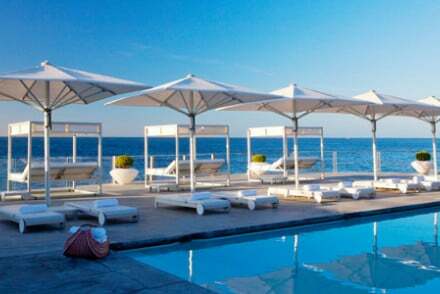 The Oitavos, set on a 400-acre estate atop rolling dunes facing the Atlantic providing contemporary 5* accommodation. With two excellent restaurants, a golf course and extensive spa facilities there is everything you need for a top romantic getaway. Lawrence's Hotel, located in nearby Sintra, offers elegant accommodation furnished in a traditional manner. Surrounded by beautiful countryside and so incredibly relaxing and peaceful. Set in a gorgeous historic building and surrounded by beautiful grounds, Penha Longa is a supreme stay. Belying the traditional facade, it provides chic contemporary rooms and features two top-notch golf courses! Choose from any one of 5 splendid restaurants and feel a million miles away from all your worries as you unwind in their spa. 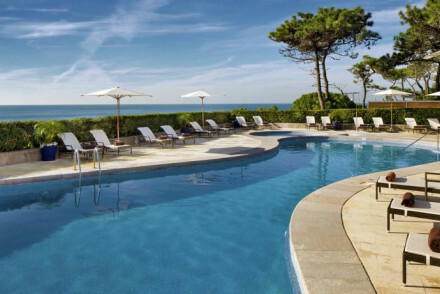 Pousada de Cascais, set within a 16th Century fortress, boasts smart contemporary rooms as well as a lovely spa. A wide range of artwork on display and two excellent restaurants to choose from. 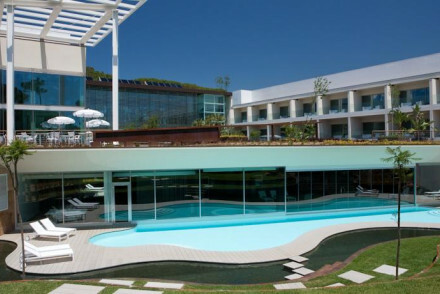 Farol Design Hotel is a cutting-edge contemporary offering accommodation with crisp, clean lines. This hip spot also features a top-notch fusion restaurant and an infinity pool overlooking the sea. 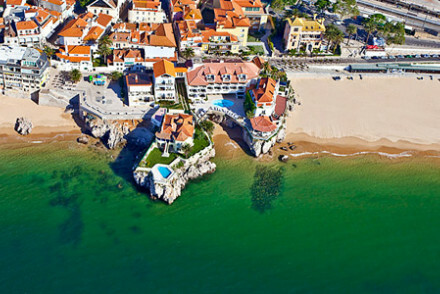 If you want to be right on the coastline then the best place to stay in Cascais is the Hotel Albatroz. Sitting prettily on a cliff top between two sandy coves, you can't be closer to the ocean. As well as having one of the best spots in town, this hotel is quite beautiful, with stylish decor in a variety of styles. The restaurant is great, and a range of accommodation to choose from - with some designed for families. Offering simple yet chic contemporary rooms, with family suites available, Martinhal Cascais is a good option if you are visiting with the kids. Their every need is catered for! They can let off steam in the playground, join in with the kids club and try out the many different eateries on site. There is also a spoiling spa for the adults! Cascais is nicest, weather-wise, in the summer. The average daily temperature rises to 23°C in July and August. This however is peak tourist season, so if you fancy a quieter and cheaper time to visit then consider coming in September or October. International guests can fly into Lisbon Airport, located 35km east of Cascais. Easyjet offer direct flights from Gatwick and Luton, British Airways from Heathrow, Ryanair from Stansted and Tap Air from London City. From the airport, either take the Metro or the Aerobus to Cais do Sodre station and then hop on the train towards Cascais. The total journey time is just under an hour. Browse though our list of all the best places to stay in Cascais. Widen the net to search through our recommendations of the best places to stay in Lisbon. An elegant villa with chic contemporary interiors in the historic town of Cascais. Accommodation is minimalist in style with polished wooden floors, white washed walls, crisp white linen and luxurious bathrooms. Featuring a large pool, glamourous bar and it's just a short walk from the beach. Local exploring - Ideally located to explore Cascais, Sintra and Lisbon. This hotel definitely does not betray its name. Its cutting edge design - clean lines and white everything - make this a very trendy spot to stay. Stunning infinity pool (almost touching the sea) and excellent fusion restaurant. A hit for for the young and hip, honeymooners or not. Swimming Pool - Infinity pool overlooking the sea. City Style - Truly hip. A Five Star hotel on the beach front. Beautiful rooms and suites have stone floors, elegant furnishings, and lots of space. Michelin star restaurant, terraces, pools, perfect views. Access to all water sports. Romantic, family friendly, beachy. Superb five-star hotel sitting right on the Atlantic Ocean. Luxury at every turn with splendid rooms, a deluxe spa and a stunning pool overlooking the bay. In the day explore the rich Moorish history of the area or just as easily unwind by the pool. A heavenly seaside oasis. Total relaxation - The ideal beachside retreat with Hammam, hot tub, massages and a salt-water pool nestled between Cascais and Guincho Beach. Romantic Break - Right on the Atlantic, it's soothing seaside atmosphere makes it perfect for a romantic holiday. Sights nearby - Castle lovers can visit the Pena National Palace, the Moors Castle and Sintra National Palace, all seven miles from the hotel. Fishing - Deep sea fishing trips can be organised by the hotel. 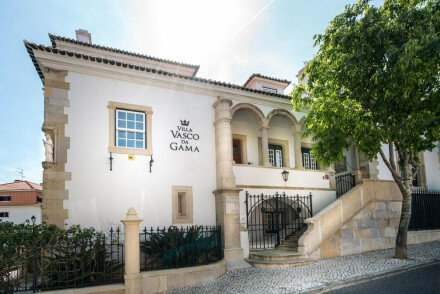 The Pousada de Cascais - Citadel Historic Hotel and Art District is set within a 16th century fortress in this seaside town. A mini city within itself, this luxurious, beautifully designed hotel comes with chic spa, stunning rooms and six galleries showing the work of resident and visiting artists. 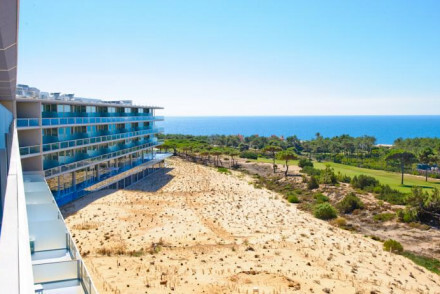 A stunning, five-star hotel set amidst the rolling dune landscape of Cascais. The elegant and coastal cool suites offer spectacular views over this four-hundred-acre estate. Brimming with all the creature comforts of a top class hotel, it's perfect for a relaxing, romantic break. Bliss. Romantic Break - This enchanting coastal property oozes romance from every pore, perfect for a relaxing break by the sea. Local exploring - Nestled into Sintra National Park, it's perfect for exploring the surrounding beauty of the area. Sights nearby - History lovers will enjoy visiting Pena National Palace and Sintra National Palace, both seven miles from the hotel. Great walks - Make the most of the beautiful walking through the surrounding national park. Luxury chic hotel on the beach. Beautifully decorated rooms and suites in pastels with sea views, private balconies, and marble bathrooms. Excellent pool and restaurant, and access to the beach. Perfect for an active beach holiday for families or couples. Sights nearby - Sintra for the Pena Palace. A trendy resort that perfectly combines style and a family friendly attitude. Chic rooms are simple in design with floor to ceiling windows and private balconies. Numerous eateries will provide options for all. A spoiling spa also offers family packages. Endless activities in-house and out. Superb. Families - Designed with families in mind. A playground, kids club and numerous in-house activities will keep little ones entertained. Total relaxation - With an excellent spa and laid back atmosphere this is a resort for completely chilling out. Sights nearby - Make a trip to UNESCO-listed Sintra with its 19th-century Romantic architecture, castles and palaces. Local markets - Be sure to visit the vibrant Cascais market running on Wednesdays and Saturdays.